Orchard of Hide & Seek Musical Cast! St. John’s Conservatory Theater (a non-profit, youth-oriented theater company) cast its third original musical comedy Orchard of Hide & Seek. Rehearsals will begin in early June and performance dates will be July 9th – 12th and 16th – 19th. The comedic interpretation of an old Irish fairytale, Orchard of Hide & Seek features original music and lyrics by award-winning playwright and composer Richard O’Donnell (who, under his nom de plum Brazillia R. Kreep, authored JCT’s hits Alice Isn’t All There & A Kreepy Christmas Carol), musical direction by Angela Dwyer & Ryan C. McNally and arrangements by Ryan C. McNally, choreography by Johanna Carmany, set and prop designs by Stephen Chambers, costumes and makeup by Ann Losurdo, technical direction and production coordination by Christopher Dwyer, and stage managed by Sadie Smith. 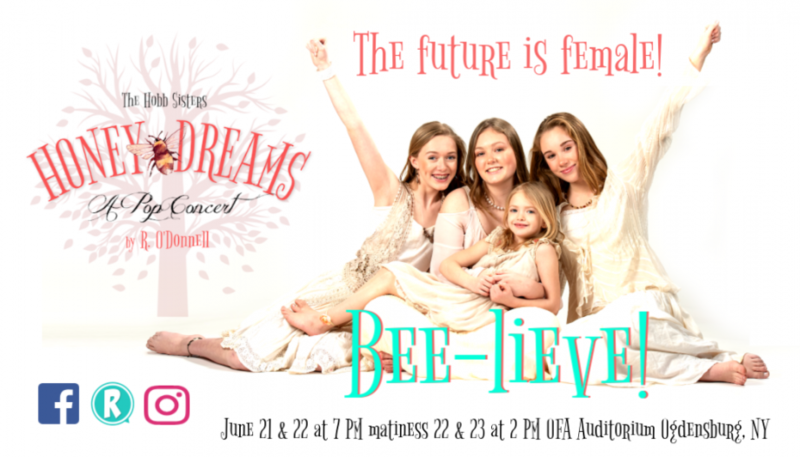 Local talent from Ogdensburg, Huevelton, and Canton make up the cast with Taylor Morrill as fairy Queen Gossamer, Myah Myers as Battyboo, Hailey Weber as Stargleam, Hailee Joanette as Raindew, Meghan Gardner as Heartglow, Sloane Ryan as Prixy Pringle, Madalyn Bascom as Trixy Tringle, Caitlin Kelly as Ariah Ropidy, Payten Walsh as Opidy Dobity, Grace Wills as Zopidy Yopity, R O’Donnell as pirate Capt. Jean-Pierre Beunet, Stefanie Jones as Scallywag, Lizette Haenel as Shivers, Rebecca Bascom as Ophelia Hollyhock the evil Witch of Hubbub, Angela Conzone Dwyer as Misty Cauldron, and Ryan Woodard as Bob the juggling Troll. The story of the Orchard of Hide & Seek concerns Queen Gossamer and her eclectic band of fairies that inhabit the old apple orchard on top of the cliffs overlooking the St. Lawrence Sea. They are preparing for their spectacular Midsummer’s Eve celebration when the children of Ennui (the tiny village that surrounds the bottom of the cliff) are playing their annual games of hide and seek. However, unbeknownst to any of them, all are in danger of the Pirate Capt. Jean-Pierre Beunet and Ophelia the Queen Witch of Hubbub, who want to take over the entire Orchard for themselves. Show times are Thursday, Friday and Saturday evenings July 9, 10, 11, 16, 17, and 18. Curtain is at 7 p.m. and July 12 and 19 at 2 p.m. The show runs about 90 minutes. Tickets cost $15 at the door (suggested donation), or $10 at Orchard.brownpapertickets.com. JCT is located on the second floor of St. John’s Parish House, behind St. John’s Episcopal Church on the corner of Franklin and Knox streets in Ogdensburg. Handicap parking is available off Franklin Street. This entry was posted in Uncategorized and tagged comedy, musical, Ogdensburg, St. John's, theater. Bookmark the permalink.